Fish eyes differ mightily from those of terrestrial animals, because the shape of their internal eye structures must account for the watery environment in which they live. While you might always see fish with their eyes wide open, it's a myth that fish don't sleep -- they just don't have the eyelids necessary to close their eyes while they rest. Fish eyes contain many of the same components as human eyes, but they are structured and used differently. Fish have a cornea or outer covering, a lens for “taking a picture,” an iris for adjusting light, a retina containing light-sensitive cells and an optic nerve for translating the picture to the brain. The cornea is very round so the fish can receive images of its environment in almost a full hemisphere about the eye, or 360 degrees. Because water has a powerful ability to refract, or bend, images, fish corneas compensate by being almost the same density as water, resulting in minor bending as images are transmitted from water into fish eyes. Unlike the corneas, fish eye lenses tend to refract light a significant amount of light. Their lenses are spherical, which means that when pointed at an image straight on, they have a good picture in the center, but vision becomes increasingly fuzzy and refracted at the edge of vision. To focus, fish must point directly at something, meaning that while their vision exists almost in 360 degrees, their vision is clearest in the middle of the picture. Land animals have an adjustable iris controlling light to the pupil. Fish do not have this -- except a few species of sharks -- but rather adjust light levels by moving their irises up and down. This takes much longer, so they sometimes have trouble adjusting to changing light levels in less than 15 or 20 minutes. Combining this with the lack of an outer eyelid, fish have a hard time shutting out bright light. To compensate, they must find shelter or dive deeper in the water. In aquariums, this often results in fish hiding for several minutes after you turn their light on. Fish completely lack an outer eyelid. In most fish, this translates to no eyelid at all, though some sharks possess a nictitating membrane. This is a thin, transparent film that can draws over the eye for protection. Fish have developed other eyelid replacements as well. Some species of bonefish have a fatty layer they can draw over their eye that, while not technically an eyelid, shuts out some light and only allows it through a small hole over the pupil. 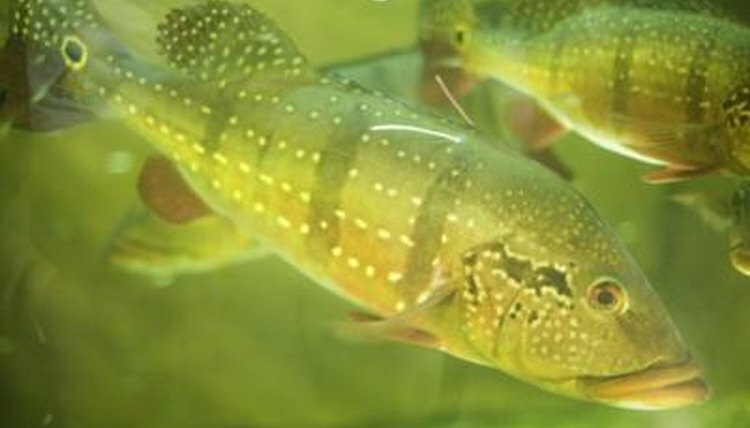 Some fish have light-activated pigments in their eyes that shade out bright lights by becoming darker. How Are the Alligator's Eyes Adapted for Seeing in Water? How Do Fish Maintain Buoyancy? Can UV Light Harm Goldfish? Why Do Nocturnal Animals Have Large Pupils? How Can Sharks Not Float or Sink? Do Fish Respond to Music?